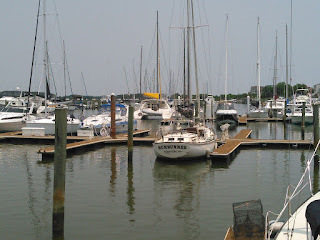 I know it has been a while since I was at the marina, but I haven't found a lot of extra time for blog posts while working on the boat. 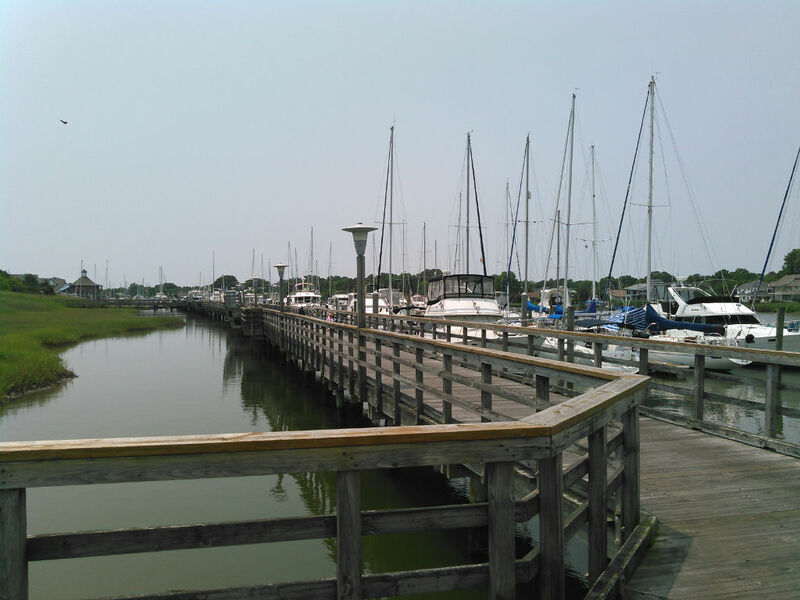 But, before it becomes too distant of a memory, I thought I would do a little review of our last marina stop, Salt Ponds Marina Resort in Hampton Virginia. I know I am always looking for information on a variety of places, so hopefully this will help someone else. Our time at Salt Ponds was nice. I got a chance to spend some time with my family and see some of the local sights, and we even got a little work on the boat done. The marina itself is interesting. I guess the best phrase I have to describe it is that it has a lot of potential. The staff is friendly and helpful, and most of the people there are super nice. You can tell the marina was once a very nice facility, but it seems a bit weathered and run down (the exception is the pool, which seems to attract a crowd and most of the maintenance attention). I guess that explains the price, which is very affordable for the area. My understanding is that it has undergone an ownership change recently and there is evidence that things are starting to get more attention so I hope improvements continue. Entrance into the marina is via a dredged channel. At the time we were there they were in the process of dredging the channel so we saw depths when we arrived as low as 4ft (while trying to pass a boat coming out the channel) and were in the 8ft range by the time we left. My understanding is that they need to dredge the channel every couple of years, so you probably want to verify depths and access if you have a deeper draft boat. It may have been the result of the dredging operation, but we found that our air conditioner sea strainer (desperately needed in the 100F+ heat index days) needed to be cleaned every week or two and contained a fair amount of growth and mud. We also found it necessary to back-flush the entire system to flush out what the strainer didn't catch. The docks themselves are nice since they are floating docks. Their construction is a butcher-block-like design and some of the wood is decaying so there are some soft spots (nothing dangerous, just small spots thus far). They have rubber rub-rails along most of the docks and I didn't find anything protruding, so they are certainly good dockage for a short or long term stay. 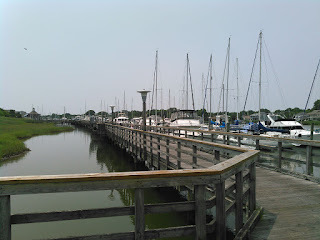 The marina lies along a channel and has a long boardwalk with 18 piers, labeled A through R, for slips and T-heads at the end of each so they can support a variety of sized boats. I know they have 30A electrical service, and I think 50 may have been available, but check with them regarding power requirements before you go. Power is sometimes metered and sometimes flat-rate, I think it depends on whether the meter on the power pedestal is working or not. The walk from end to end of the marina boardwalk is about a mile long. Rover at the dock in the distance. I guess this is a good time to bring up the bath houses. There are 3 along the stretch of boardwalk (the web site states 4, but I don't recall seeing the 4th), which is good since it would be a long walk from the end piers to the office when you needed a bathroom. The bathrooms are where you can best date the age of the marina...or at least their last make-over. The sinks in the main bath house are molded "green pearl" plastic sinks that are cracking and weathered and give a distinctive 70's feel. The walls of the stalls are rusting, and there is a general need for caulking and updating. Two showers are available. The remote bath house at the far end (near piers N through R..the one closest to us) was a bit more utilitarian with white wall mount sinks and one piece plastic shower stalls and the same rusting metal stall dividers. The showers each had a three hook bar, which is good when you need a place to hang your towel and clothes. The flooring in this bath house is soft in spots so one toilet rocked a bit, and the floor outside the shower was of questionable stability. The remote bath house had a pay washer and dryer in each of the men's and women's sides. At a minimum, the bath house needed a good cleaning, some floor repair, and caulking to prevent continued water damage to the floors. The remote bath house could also use a No Smoking sign that was obeyed (Virginia, presumably because it is a tobacco growing state, seems to have a high number of smokers). The boaters seem a bit rough on the facilities...possibly because they feel "why bother" given their current state. The boardwalk. About half of the walk to the office for us. The main office and pool area is a bit of a hike, around 1/2 to 3/4 of a mile from the outlying docks. Many of the regular tenants have golf carts to make the trek. This is also the location of the main parking lot and can be quite a hike to your car if you have one. There is a small parking lot near the higher letter docks, but there seems to be a fight for control of it between the marina and the gated housing development. The office has some supplies, t-shirts, ice cream, and drinks. They usually have coffee available in the morning as well. While I did not use it, the pool seems to be a good size for the facility and a very nice area for lounging at the marina. I'm told that the pool and a common area that is part of the office can be "signed out" for an evening if you want to have a party or gathering. This is a particularly nice feature if you would like to do some entertaining not on your boat. Salt Ponds has fast internet access, but the fast only seems to exist at the office and common area. There are wireless repeaters that attempt to spread the signal down the docks, but like many marinas, they don't seem to work very well. We were on the T-head of dock Q and the closest WiFi router could be connected to but didn't seem to have any internet access except on very rare occasion. Using a long-range WiFi antenna, I was able to connect to repeaters down the dock and closer to the office and could get marginally usable internet there. I usually had to play a game of "which router is working today" in order to get access from the boat. On the marina grounds there is a restaurant and Tiki bar. The bar even has it's own pool. Food at the restaurant the one time we tried it was decent, especially for being so convenient. Groceries or other supplies not found in the office are not as convenient. There are a couple small convenience type stores a long walk or medium bike ride away near Buckroe beach. Going further, there is a Farm Fresh supermarket in Phoebus (the one we went to when anchored at Ft. Monroe), and a Sav-a-lot about equal distance away. The neighborhood along the beach consists mostly of nicer vacation/rental type accommodations, and become more modest as you move away from the shore. 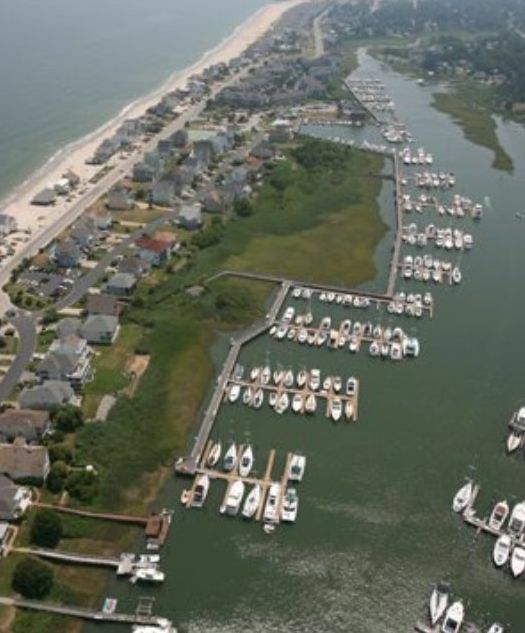 There is a small beach across the street from the marina (beaches behind the beach houses are private) and the public Buckroe beach is a moderate walk or short bike ride away. 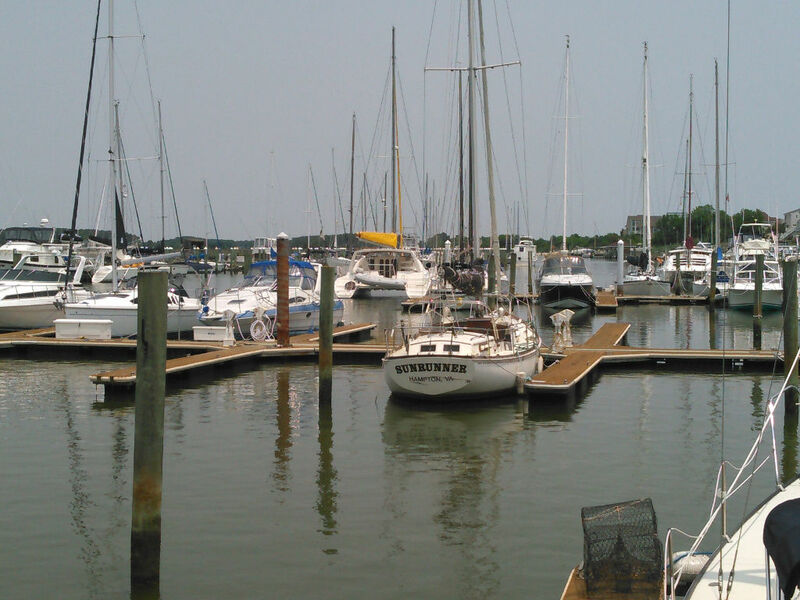 Overall, the marina is worth a stop if you are looking for a marina to hang out at for a while in the southern Chesapeake. It is an aging "resort" but has some nice amenities at a reasonable price.